But in our rapidly changing world, the role of the engineer is constantly evolving and often overlooked. 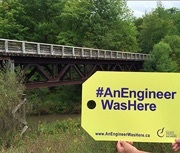 The Ontario Society of Professional Engineers (OSPE) and its members and partners are reminding Ontarians that everywhere they look – #AnEngineerWasHere. How you live, travel, learn and experience the world is made possible by the expertise of engineers. From soaring towers and city grids to cars, phones, and computers, the engineering profession impacts almost every part of daily life. Engineers must be at the table before decisions are made regarding infrastructure, climate change and other complex issues, so that the future of our province is based on technically and economically sound principles. Today is the day we recognize and promote our profession in Ontario and all the things that involve us. This is a Discus 2b. How you live, travel, learn and experience the world is made possible by the expertise of engineers. From soaring towers and city grids to cars, phones, and computers, the engineering profession impacts almost every part of daily life." Here in Parry Sound we have the trestle bridge to remind us of the importance of engineering! Post share a picture of something in your life that was made possible through the engineering profession. Thanks @o_s_p_e for driving this! 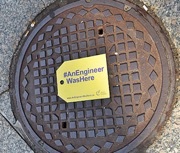 Everywhere you look #AnEngineerWasHere. Especially at all the different consoles that we can control #spacerobots from; including the Robotic Workstation on the #ISS, the model we use at the Neutral Buoyancy Lab for #EVA planning, the control room @csa_asc, and #MissionControl! completed in less than two years. It included the design and construction of the pumping station, twin forcemains, gravity trunk sewer and watermain. Just one of the things we take for granted on a daily basis thanks to the skilled work of professional engineers! 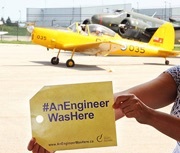 #AnEngineerWasHere Kudos to @O_S_P_E for getting Ontarians thinking about the invisible work engineers do. #AnEngineerWasHere The audio player (all hi-res audio standards formats) fits nicely into the small case for the acoustically engineered In Ear Monitors. Students especially appreciate the engineering that went into these ! We’re proud to support Ontario’s engineers w/ our partner @O_S_P_E to recognize engineering innovation for their #AnEngineerWasHere campaign! Did you know #AnEngineerWasHere to protect your home from water damage by helping develop our alert detector? #DYK Willis Chipman, P.Eng., is best known as the originator of separate systems for sanitary and storm sewers, laying the foundation for a new standard in drinking water quality and waste water treatment in Canada? #AnEngineerWasHere and today we acknowledge a staple in any traditional office setting, the laser printer! American #engineer Gary Starkweather invented the Xerox 9700 and essentially created the digital printing industry as a result. An Engineer Was Here Too! 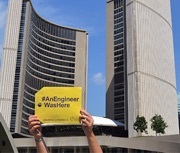 Ontario Society of Professional Engineers (OSPE) and its members and partners are reminding Ontarians that everywhere they look – #AnEngineerWasHere. Without Engineers, who would keep you cool? The Ontario Society of Professional Engineers (OSPE) is the voice of the Engineering profession in Ontario. OSPE advances the engineering community’s professional and economic interests by advocating with governments, offering valued member services and providing opportunities for ongoing learning, networking and community building. By elevating the profile, understanding and reputation of the engineering profession, OSPE ensures that Ontario’s engineers are empowered to use their expertise to make a difference. As dedicated advocates for the profession, we work with governments and legislators to create policy changes on issues of importance to Ontario's engineers. You belong here. 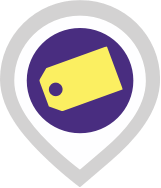 Membership provides access to networking events, mentoring programs, and volunteer opportunities that foster meaningful professional relationships. Our membership is as diverse as it is passionate. From new graduates to seasoned professionals, diverse thought and opinion are championed at OSPE. Becoming an OSPE member should be part of your career path. We help to prepare members as they transition throughout their professional development. 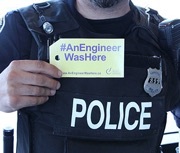 What is the purpose of the #AnEngineerWasHere campaign? The issues facing Ontario, Canada and the world are increasingly complex and technical in nature, and yet the role of the engineer is often overlooked. 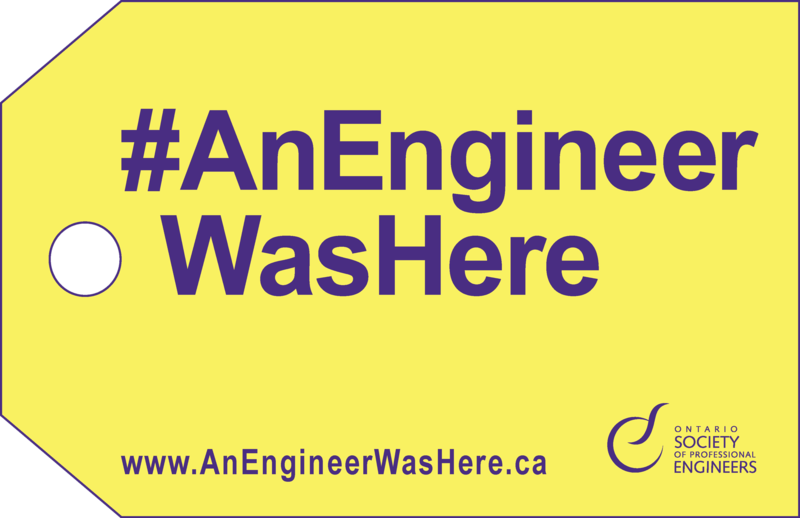 OSPE’s #AnEngineerWasHere campaign is designed to promote the engineering profession and to raise awareness about the critical role that engineers play in making our world work. What does it mean to be an engineer in Ontario? Having an engineering degree from an accredited engineering program is only one of the required steps to become a professional engineer in Ontario. Being an “engineer” means that an individual has received their engineering licence – referred to as a P.Eng. designation – from Ontario’s regulatory body, Professional Engineers Ontario. You must have a licence to be called an “engineer” in Ontario. How many engineers and engineering graduates are there in Ontario? There are approximately 80,000 professional engineers and 250,000 engineering graduates in Ontario. How do I know if engineering is the right career choice for me? Are you creative? Do you enjoy puzzles and problem-solving? Do you want to make a difference in people’s lives? If so, a career in engineering may be a good fit for you! If you’re curious about the different types of engineering and career opportunities out there, visit OSPE’s blog to read about the cool projects our members work on every day. 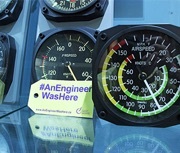 What about the other professions involved in creating the objects and structures that have been marked with the #AnEngineerWasHere tag? 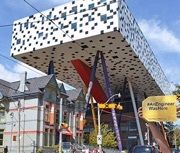 While this campaign specifically celebrates the contributions of Ontario’s engineers, other professionals such as architects, developers and scientists, also play a vital role in creating many of the technologies, objects and structures that make our world ‘work’. One of the most notable features of the engineering profession is that it is collaborative nature. Engineers work closely with experts from other fields to improve our standard of living. When can I use the hashtag #AnEngineerWasHere? OSPE invites you to help keep this important conversation going year-round. 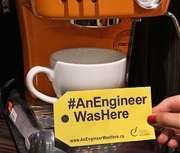 Whenever you find a great example of engineering excellence, use the yellow #AnEngineerWasHere tags and hashtag on your favourite social media channels to highlight the work and expertise of engineers.